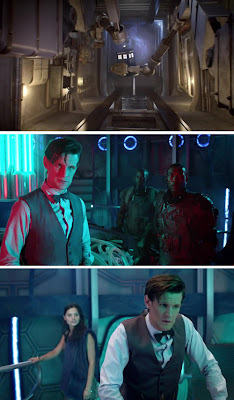 It has a title that evokes a thrilling Jules Verne adventure, and that's mostly what we got with Stephen Thompson's "Journey to the Centre of the TARDIS" (hereafter "Journey"); an eagerly anticipated episode because it promised to show us areas of the TARDIS beyond the console room. Most people know a thrifty BBC budget is what originally constrained Doctor Who's iconic time machine, leading to the master-stroke of it appearing outwardly smaller, but it became something of a running joke that you rarely see much of the interior, either--most notably with the frequent mentions of it having a swimming pool during Steven Moffat's era. 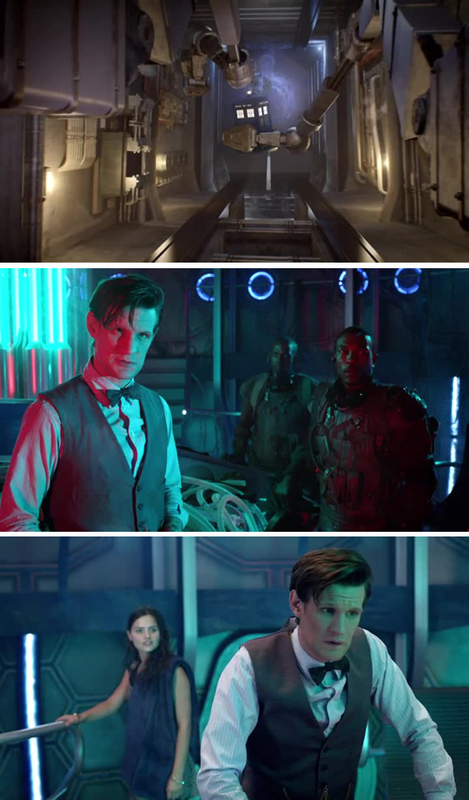 And while there have been occasions where ancillary rooms or corridors were glimpsed (most notably during 'The Doctor's Wife' last series), "Journey" finally took viewers deep into the TARDIS, with The Doctor as a quasi-Willy Wonka guide and rescuer, and it was mostly worth the wait after half a century. 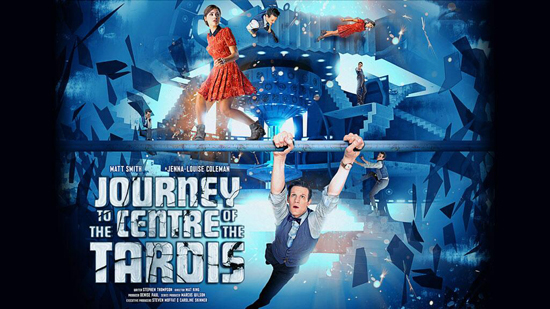 "Journey" found The Doctor (Matt Smith) and Clara (Jenna-Louise Coleman) imperilled by an opportunistic salvage crew led by Van Baalen (Ashley Walters), his brother Bram (Mark Oliver) and android Tricky (Jahvel Hall)--who seized the TARDIS while its defences were momentarily down, allowing it to be pulled aboard their salvage vessel for dismantling. 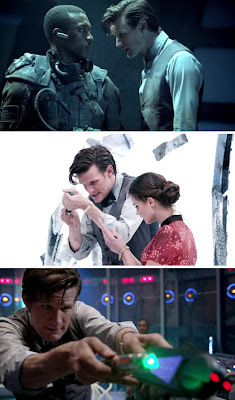 Illogically, The Doctor somehow appeared outside of the TARDIS after it was captured, which enabled him to trick the Van Baalen's into helping him find his missing companion--as Clara was, again illogically, suddenly lost in the bowels of the TARDIS. There were elements of this story that weren't as smoothly written as you'd hope them to be, but for the most part "Journey" held together well. The most perplexing moments (Clara being chased by ossified zombies with red eyes) were eventually explained well enough; and at this stage in nu-Who's history I'm used to plot contortions being used to fix oddities. It helped that this episode's potential deus ex machina had been foreshadowed early, which made it feel earned and justified. The only thing that truly bothered me was the reason for Van Baalen convincing his own brother he's an android after he lost his sight, voice, and memory during a salvaging disaster. It felt like a plot-twist for the sake of one, because otherwise the three siblings were just annoying and badly-acted headaches for The Doctor to contend with and bounce ideas off. We know Clara's true nature is going to be revealed in the finale, and it likely has something to do with the return of River Song (is she a message of some kind? ), so maybe this overt nod to the Time War is foreshadowing bigger explanations about the off-screen event that occurred between Paul McGann and Christopher Eccleston's Time Lord incarnations. It also crossed my mind that The Doctor's climactic plan to leap back into his own past to reset time might be a valid way to get David Tennant's Doctor involved in the 50th anniversary special in November. It would certainly save valuable time because audiences understand how this could happen after being given an example here. Overall, I enjoyed "Journey" on the level it was aiming for. It was a fan-pleasing episode crammed full of trivia and geek-bait touches (did you hear the voices of past Doctors and companions in the console room at one point? ), and undoubtedly this is Stephen Thompson's best episode for Doctor Who after 'The Curse of the Black Spot'.